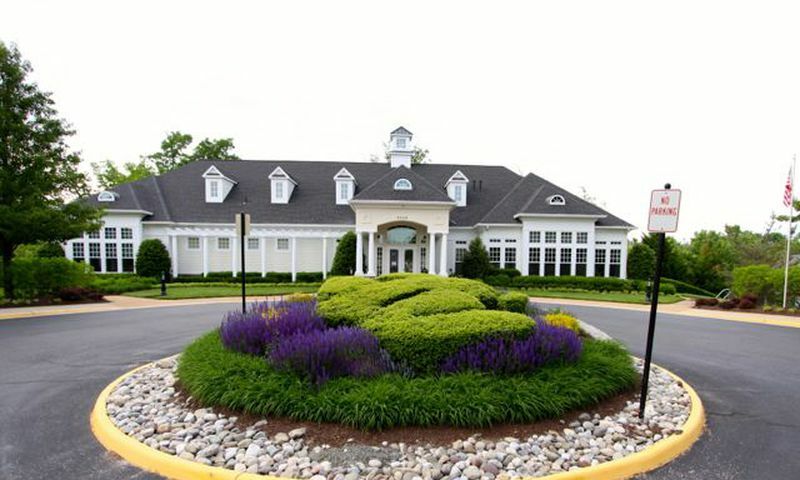 Dunbarton in Bristow, VA is an age-restricted active adult community that welcomes residents aged 55 and older. This lovely community, which contains both single-family and attached homes, is part of the larger community of Braemar. The community boasts a variety of amenities to support an active lifestyle including a fitness center, indoor and outdoor swimming pools, billiards, and lovely walking trails. With 479 homes, Dunbarton at Braemar is an intimate community, ideal for active adults who want to live in a quiet, neighborhood setting. However, there are still many activities and social clubs, as well as a part-time activities director. The picturesque setting of Bristow provides a lovely environment that is within close proximity of area attractions and only 45 minutes from Washington D.C. The community amenities begin at the Dunbarton clubhouse. This 21,000 square-foot facility houses a fitness center, indoor swimming pool, billiards and a grand ballroom which is ideal for social events and community parties. There is also an outdoor swimming pool and tennis facilities within the larger Braemar community. While Dunbarton is a smaller, more intimate community, residents can find plenty of activities throughout the year at the spacious clubhouse. An on-site activities director is available every Tuesday, Wednesday and Thursday to help residents make the most of the active social life at Dunbarton. Homes were built by Brookfield Homes and Patriot Homes between 2000 and 2009, the residences at Dunbarton include both single-family and attached duplex homes. The single-family homes at Dunbarton range in size from 1,768 to 2,197 square feet. The attached duplex homes are a bit smaller, ranging in size from 1,506 to 1,740 square feet. These previously owned homes within Dunbarton at Braemar were built with active adults in mind and offer many desirable features including spacious first-floor master bedroom suites with luxury master bathrooms. Some of the homes within Dunbarton include basements, and most feature space for outdoor living in the form of front porches, patios or decks. Each single-family home includes an attached two-car garage while the attached homes offer an attached, rear load one-car garage. Dunbarton is a gated active adult community designed for residents aged 55 or better. As one of the best kept secrets in Bristow, Dunbarton s primary charm comes from its quiet neighborhood environment. The community offers picturesque, manicured streets lined with lovely, landscaped homes. Inviting front porches and extensive walking trails and paths encourage residents to explore the community and visit with their neighbors. Though Dunbarton is a small community, it offers several social groups. There are men's and women's clubs, as well as many special interest groups. Among these groups, there are book clubs for those who enjoy discussing literature, a wine tasting club, a scrapbooking club for crafty residents and a local Red Hat Society for women who enjoy a variety of day trips and activities. Set in western Prince William County s lovely Bristow area, Dunbarton is approximately 45 minutes from Washington D.C. Convenient access to route I-66, the Virginia Railway Express and the local commuter bus service make it easy to travel into the District. Yet there is plenty to do closer to home as well. Prince William County is known for its rich Civil War History, and is the site of both Battles of Bull Run. The community also lies only 10 miles from Historic Old Towne Manassas, which offers quaint shops and charming restaurants. Dunbarton s surrounding area offers modern day activities as well as historic attractions. For those who like to shop, the sprawling outlets at Potomac Mills Mall (and plenty of additional shopping centers) can be found within 20 miles of the community. The Bristow area also includes convenient services for daily living, including grocery stores, hair and nail salons, medical facilities, restaurants, shops and much more. Those looking for an inimate community with age-restricted resale homes in Northern Virginia should look no further than Dunbarton at Braemar in Bristow. Clubhouse - 21,000 Sq. Ft. There are plenty of activities available in Dunbarton. Here is a sample of some of the clubs, activities and classes offered here. Attached homes were designed in two floor plans by Brookfield Homes. They range in size from 1,508 to 1,740 with two bedrooms, two bathrooms, and an attached one-car garage. These are great low-maintenance options for active adult homebuyers. The Manor homes are the smaller collection of single-family homes built by Brookfield Homes. Offering 1,768 to 1,944 square feet of living space these homes typically have one to four bedrooms, two to three bathrooms, and an attached two-car garage. The Country Collection offers the largest homes built by Brookfield Homes. They range in size from 2,197 to 2,715 square feet. Most of these single-family homes have two to three bedrooms, two or three bathrooms, and an attached two-car garage. The majority of homes within Dunbarton were developed by Brookfield Homes, however Patriot Homes built 50 single-family homes as well. There were three floor plans with two to four bedrooms, two-and-a-half to three-and-a-half bathrooms, and an attached two-car garage. Dunbarton is a nice neighborhood. I like that it is gated and the monthly fees are not too bad. It includes all the amenities plus basic cable and internet too. The prices are a little high for the homes but for what you get it's worth it. In my opinion the gym and the game room could use some updates. The putting green and pools are nice, as are the trails and community landscaping. 55places.com is not affiliated with the developer(s) or homeowners association of Dunbarton. The information you submit is distributed to a 55places.com Partner Agent, who is a licensed real estate agent. The information regarding Dunbarton has not been verified or approved by the developer or homeowners association. Please verify all information prior to purchasing. 55places.com is not responsible for any errors regarding the information displayed on this website.